Home » Blog » How Do People Choose Where To Live? When searching for a place to live, location can make or break your decision. Of course, the ideal location differs from person to person, however there are some regional trends that seem to affect the desirability of a new home location. 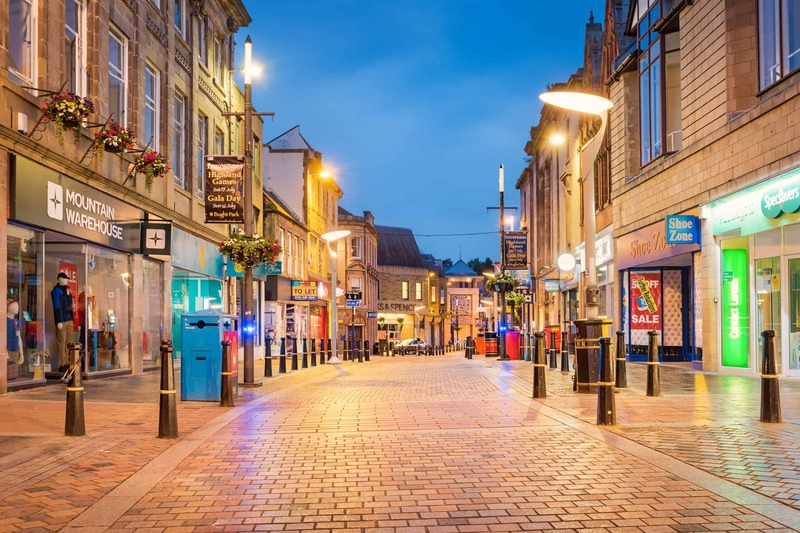 Good Move has looked into what homeowners want from the area where they live and broken down the results for different areas of the UK. The majority of the UK chose scenic views as their highest priority when looking at a potential place to live and Central England (44%) are no different, and who can blame them with the Peak District on their doorstep? 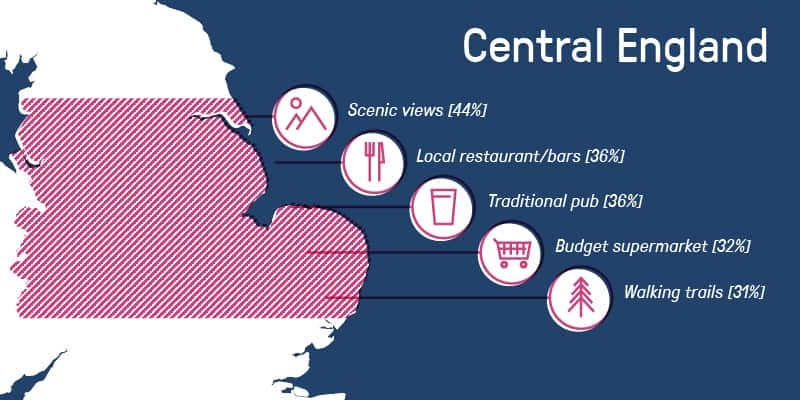 Local restaurants or bars and traditional pubs were also popular across the country and took second and third place for Central England with over a third (36%) of people in this region choosing the social environments. This region is also keen on their budget supermarkets such as Aldi and Lidl (32%) as an important preference in the UK and placed them fourth just above the beautiful walking trails (31%) of the Midlands. Northern England shows similar results to central England, sharing the same top five priorities. However, budget supermarkets are the second most important (43%), especially Aldi with the majority of the north (21%) choosing it as their favourite supermarket. Over half (51%) of northerners value scenic views and chose this as their number one location must-have. 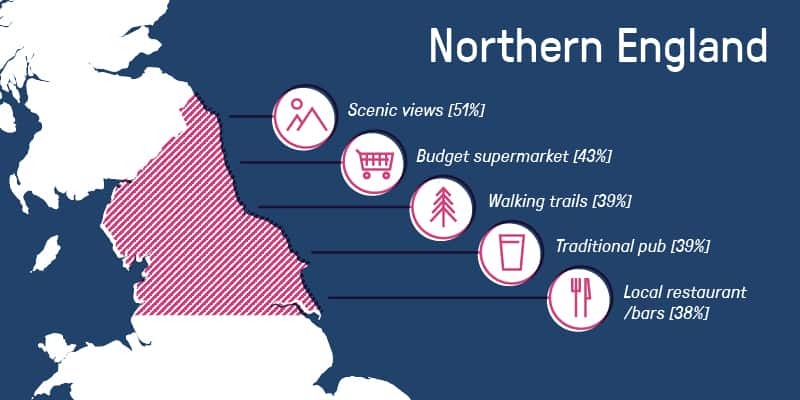 Northern England also prioritises walking trails (39%) and traditional pubs (39%) to local restaurants or bars (38%). This could be because of Yorkshire’s picturesque walking trails and friendly local town pubs on offer. 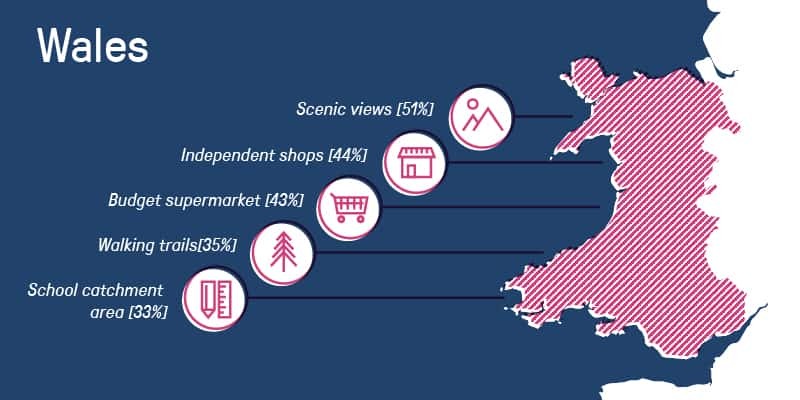 Scottish people are less concerned about locations with scenic views, choosing to opt for independent shops (35%) instead. 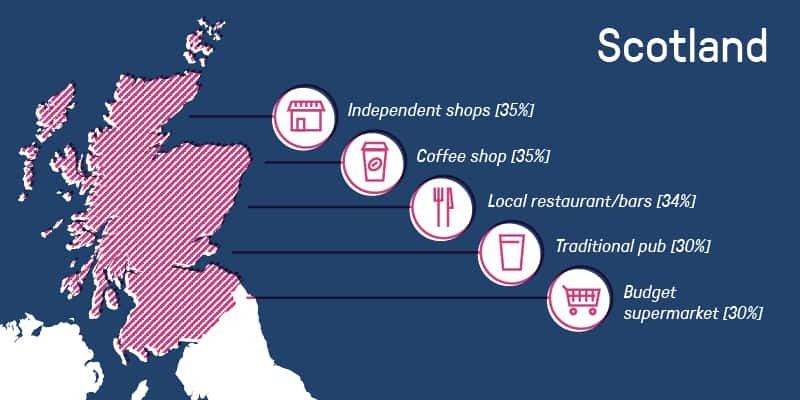 Scotland also loves its Starbucks and Costa Coffee as it was the only region to prioritise having a coffee shop in their vicinity, with over a third (35%) saying it is important. Local restaurants and bars (34%), traditional pubs (30%) and budget supermarkets (30%) make up the remainder of Scotland’s top five. Scottish locals prefer to live near an Asda, whereas the rest of the UK, except Northern England, favour Tesco. Those in the South East like a selection of groceries, with both high end and budget supermarkets at their location’s most desirable aspiration, with just short of half (43%) agreeing that they are a necessity to live close to. 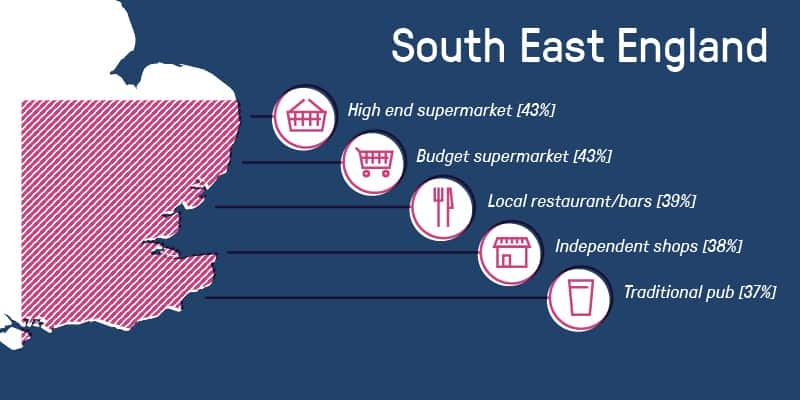 Independent shops are also advantageous to over a third (38%) in the South East, sitting just below local bars or restaurants (39%) and just above a traditional pub (37%). 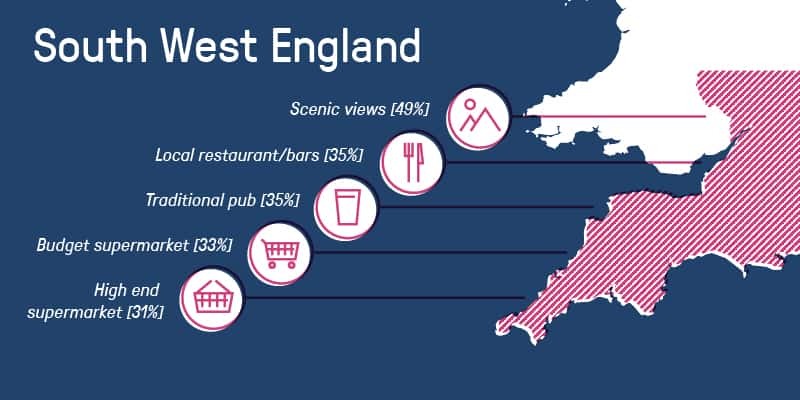 Scenic views (49%) topped the list once again for South West England and what better than a drink and a meal in a local restaurant, bar or pub (35%) to help enjoy the views. Budget supermarkets are slightly more desirable than high end supermarkets in this region with a third choosing to be near an Aldi or Lidl., and 31% wanting to be close to a Marks and Spencer or similar. Not surprisingly, over half (51%) of the population of Wales would like to live in sight of the lovely Welsh views. Independent shops are ever so slightly more important to them than a budget supermarket, chosen by 44% and 43% respectively. However, like Northern and Central England, Wales also loves a good walking trail placing it at number four on their priority list with 35%. Wales is, interestingly, the only region that still considers school catchment area when choosing a location to live with a third (33%) saying that it would impact their decision on location. Do you agree with your area’s aspirations? Let us know by tweeting us at @GoodMoveUK.